Why hire me? As a professional maternity, newborn and baby photographer serving the Seattle area, I pride myself in capturing and creating the precious images of the miracle that you helped create. The amazing journey of pregnancy, the awe of a new baby, the elation of their first achievements…these moments fly by so quickly and your memory of them fades over time. Every now and then, I hear, “All you do is push the button on the camera—why does your service cost so much?” or “I can buy a nice camera and take my own pictures for less.” Like any quality products or services out there, good photography is expensive because it is not easy to create. Bad photography is even more expensive. If you do not like your photos, you have wasted your time, money and memories; and if there is a second chance, spend more money for a better photographer. When you commission a professional photographer you are paying for their expertise, talent, and time to ensure that your images will be captured perfectly and professionally…the first time. 8 – 16 hours – Upload and back up photos. Cull and edit photos (color correction, toning and retouching). If your gallery includes technically difficult shots (baby hanging from a tree branch or prop, posing sitting up, etc), then more time is needed in Photoshop. 3 – 4 hours – Set up the online gallery. Process retouching requests, final check for quality, prepare images on USB, print, canvases, etc. Package and ship. As you can see, the time spent for one session can range from 15 – 26+ hours. Because professional photography is time- and labour-intensive, I only accept very limited bookings per month to ensure I have plenty of time to perfect your images. One of the most important qualifications for a newborn photographer is their ability and experience in handling a newborn and posing them safely. 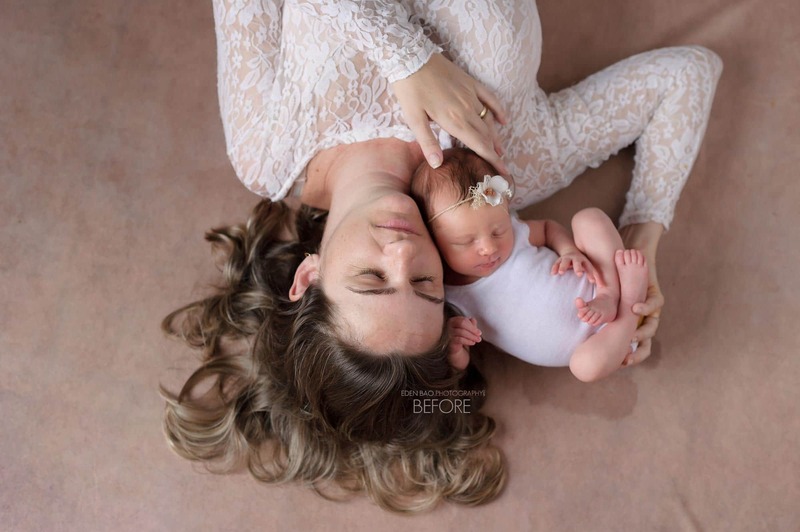 You are handing over your brand new baby to a photographer to hold, soothe, pose in and on props. You need to trust that this person knows what they are doing, just as you would with your midwife and doctor. 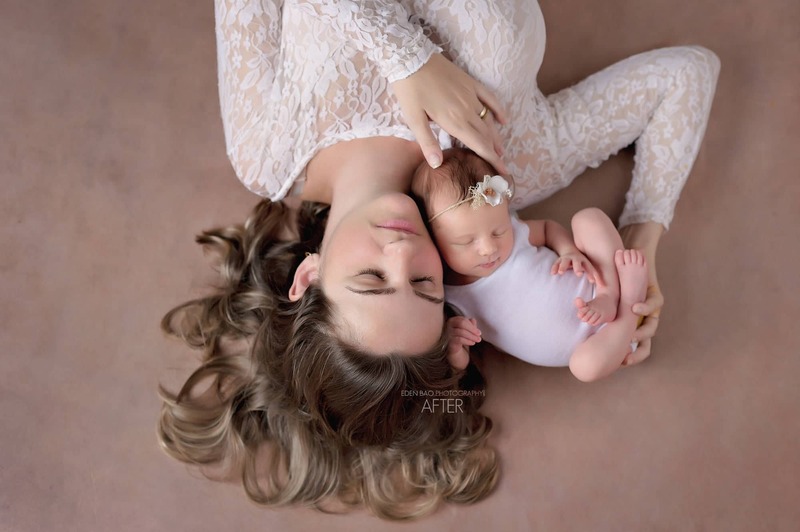 As a mother of two and a newborn photographer, I have years of experience in soothing and calming babies, a skill that is necessary for a successful session. I am also experienced in posing babies in a way that always guarantees their safety and capturing very popular poses like baby’s hands on the chin, hanging babies with wraps, or putting babies into props like crates or buckets. I consider this so important that I have written a separate post dedicated to newborn posing safety. Please take a moment to visit that page to see how I pose a baby safely. To give you professional quality images, I use more than $30,000 worth of professional-grade equipment—cameras, lenses, studio lighting, computer and software. Although cameras out there are very good, consumer cameras do not match the quality of a professional camera. In addition, I stock over $10,000 worth of quality props such as blankets, hats, headbands, crates, buckets, flooring and backdrops to ensure a wide variety of beautiful set-ups to suit your style. Professional photographers will know exactly how to capture the very best images. Not only do they know how to use their camera to get the proper exposure, focus and composition, they also know how to light and pose their clients properly. They have the ‘eye’ to compose distinctive images and enhance them with a professional photo-editing software. As a professional photographer, I know the importance of my job in capturing quality images for you and therefore commit thousands of dollars and countless of hours in continuing education to perfect my craft. I was formally educated in professional photography and studio lighting at Langara College, Vancouver, BC and maintained my knowledge and skills by attending workshops and on-line courses. I am also a proud member of the Master Photographers of Canada and Professional Photographers of America. One way to differentiate an amateur from a professional is the consistency of their work. An amateur photographer’s portfolio may show nice images, but those images are a compilation of one or two accidentally good images from many sessions. The professional will show quality images consistently in both their portfolio AND recent work on their blog. If you hire an amateur to shoot your session, you accept the risk that there may only be one or two good images from your session vs. the 20-30 great images that I will provide in your gallery. When you hire me, you buy the assurance that your images will be high quality and the peace of mind that your special moment is captured perfectly before it is lost in time. In conclusion, the old adage “you get what you pay for” is true. I hope you can see the value of hiring me, a true professional who focuses on quality rather than hiring a photographer based on price alone. Interested in booking a session? Have more questions? Please contact me via email: eden@edenbaophotography.com or the Contact Me form so we can chat! Eden Bao is a premier maternity photographer, newborn photographer, baby photographer and family photographer. Our studio is based out of Bothell and we serve Seattle and the surrounding areas, including Mill Creek, Everett, Mukilteo, Woodinville, Snohomish County, King County, Skagit County, Pierce County, Bellevue, Kirkland, Edmonds, Lynnwood, Marysville, Lake Stevens, Sammamish, Redmond, Issaquah, Renton, Shoreline and the Pacific North West. A proud member of Master Photographers International and Professional Photographers of America, Eden Bao takes pride in capturing your memories with care, creativity and professionalism.